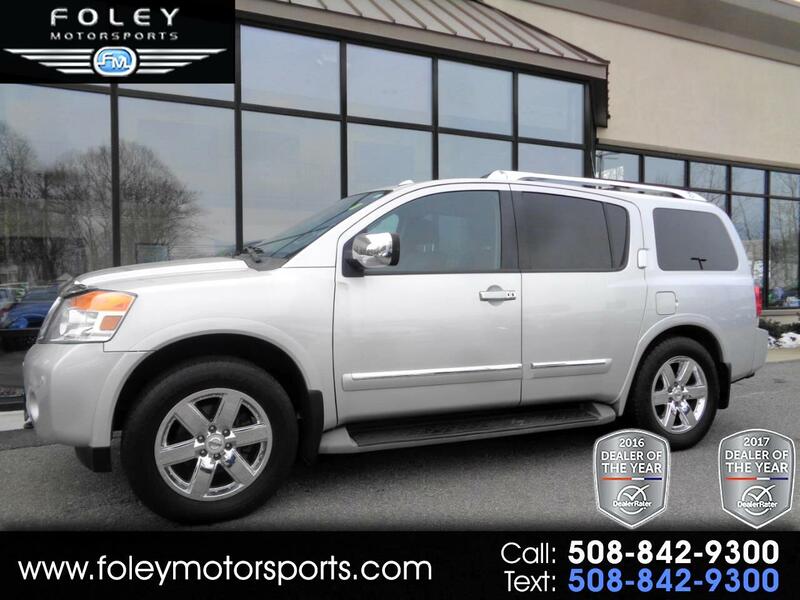 ***Nissan Armada Platinum 4WD*** Nav, Rear DVD, Bose, Mid Row Buckets, 3rd Row, Tow, JUST Traded!! JUST Traded!! 2013 Nissan Armada Platinum 4WD... Brilliant Silver Metallic on Charcoal Leather Seating... 317hp 5.6L V8 Engine... Automatic Transmission... Very CLEAN... Recent TRADE-IN... LOADED with Navigation System... 20'' Chrome Wheels... Front Parking Sensors... Power Sunroof... Heated Front and 2nd Row Seats and Steering Wheel... Rear-seat DVD Entertainment System with dual 7-inch headrest-mounted screens and a Bose Audio System with Digital Music Storage... 2nd Row Captain's Chairs... 3rd Row Folding Seats... Luggage Rack... Tow Pkg... Running Boards and much more!! Safety features include Antilock Disc Brakes, Traction and Stability Control, Front Seat Side-Impact Airbags, Full-length Side Curtain Airbags and Front-seat Active Head Restraints. Please feel free to contact our experienced sales team with ANY questions or to schedule a test drive. Buy with confidence from the area LEADER in Pre-Owned LUXURY. Additional 5 Year/100K Extended Warranty Coverage Available. ALL of our vehicles are meticulously detailed and serviced by our factory trained certified technicians. Call or email us at sales@rjfoley.com **$0 Down** 100% financing available with great rates! Trades are always welcome. National and International shipping quotes are available.